Sigh…optimistically, I’d like to believe that writing a sizable number of comics (let’s say 100, in which case we are 25% of the way there) should help develop my cartooning skills to a somewhat higher level. And yes, they are improving, but realistically, I think I need some more formalized instruction, if only through some kind of web module. What I’m saying is that Dragon jumping up on down on the snake’s corpse is not quite right. There’s something missing from my depiction, both in terms of accurately portraying the act of jumping up and down in a recognizable form, as well as in terms of the comedic value that such a drawing should communicate to the reader. However, The Man asks a perfectly cromulent question. How long has Dragon been sitting inside that magical cave, drawing? Also, the expression on The Man’s face, and the way he’s desperately trying not to look, maybe are kind of funny. In panel 3, the way the snake is lolling on its back, it’s sort of asking for a beatdown. 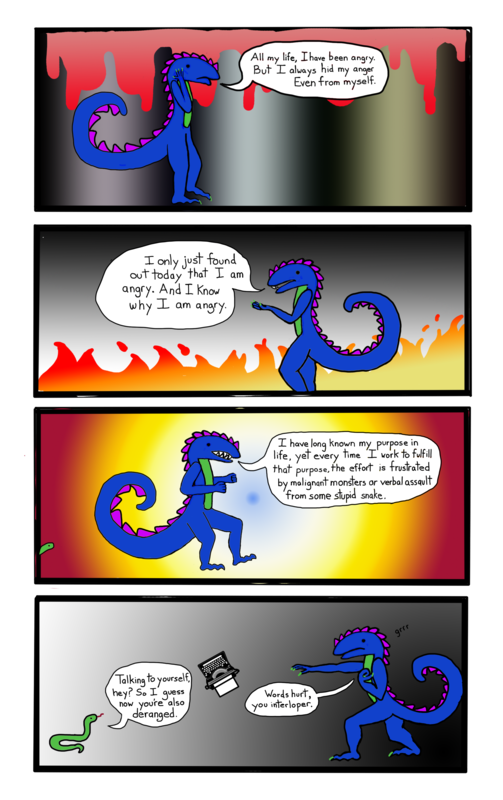 This entry was posted in Comics, Dragons and tagged anger, cabin fever, comics, dragon, rage, snake, typewriter, uninvited, webcomics on October 15, 2014 by littledragonblue. The Man is the one with the real vendetta against the Kindles; they’re a convenient focus for Dragon’s rage. This was a fun one to draw. I’m particularly enamored of the Godzilla stuff going on in panel 3, and I was pleased to figure out how to draw the second panel without using a source image or looking at myself in the mirror. 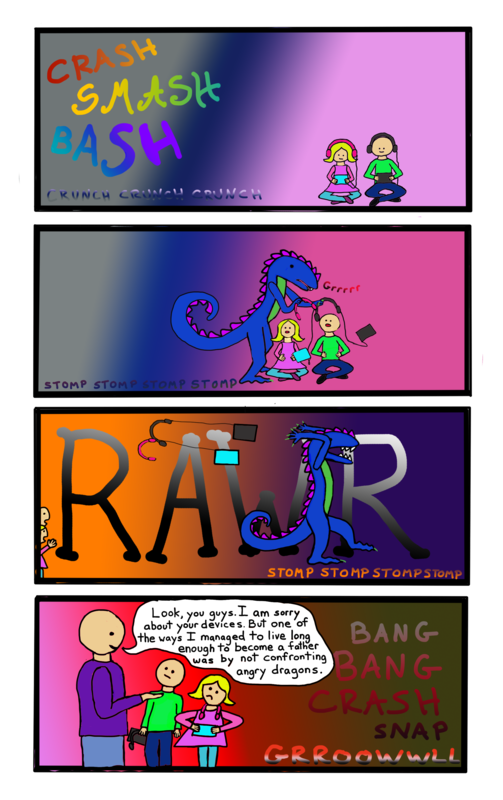 My only sorrow is the SFX words in panel 4, which are OK, but didn’t seem quite right. In case anyone gets the wrong idea, I never take my aggression out on the children. That stuff is reserved for The Man. Don’t worry; he can take it. But the thing is, when dragons get angry, you don’t want to get in their way. Fortunately for the world, Dragons are slow to true anger. 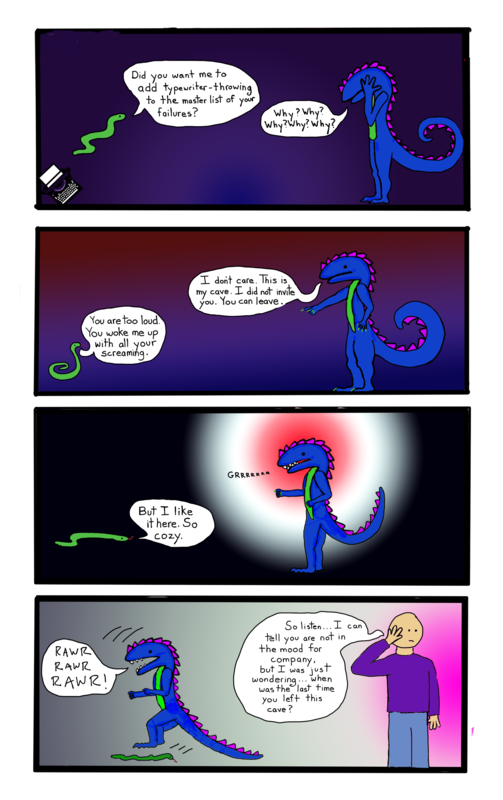 This entry was posted in Comics, Dragons and tagged anger, comics, devices, dragon, godzilla, headphones, kids, kindles, rage, webcomics on October 10, 2014 by littledragonblue.